Lecturers accused Nick Clegg of "spinning his way out of trouble" over university funding today, following his u-turn over tuition fees, writes Shamik Das. Lecturers accused Nick Clegg of trying to “spin his way out of trouble” over university funding today, following the deputy prime minister’s interview in The Guardian in which he tried to paint himself as the students’ friend – claiming his personal intervention ensured university funding was only cut by 40 per cent in the Comprehensive Spending Review (CSR). 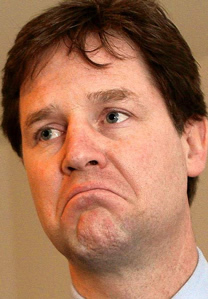 In this morning’s interview, Mr Clegg also described the CSR as “thoughtful” and accused the Institute for Fiscal Studies (IFS) of “distorted nonsense” after the IFS said the government’s tax and benefit changes “are regressive rather than progressive across most of the income distribution”. This is not the first time the Liberal Democrat leader has hysterically attacked the respected think tank for contradicting him; in August he described its analysis of the emergency budget as “partial” – just months after saying he was “really delighted” with the IFS’s account of his election manifesto. Universities are facing cuts of £2.9 billion over the next four years, teaching budgets are being slashed by more than three-quarters, and tuition fees are set to rocket in the wake of the Clegg-endorsed Browne review – this despite him, along with every other Lib Dem general election candidate, pledging “to vote against any increase in fees in the next parliament and to pressure the government to introduce a fairer alternative”. “Nick Clegg’s supposed intervention has left universities facing massive cuts and left students having to pay the highest public university fees in the world… This is a feeble attempt by the deputy prime minister to try and extricate himself from the controversy of going back on his pledge over tuition fees. For starters lets not forget who introduced tuition fees. Lets not forget also that Labour were perfectly happy to see the people of England get by far the least per person, per year funding via Barnett bribe. Lets not forget that Scottish students continue get their fees paid for by the “state” while English students face unlimited rises and possibly a graduate tax? If I was one of Nick Cleggs constituents I would be outraged – why doesn’t he stand up for them? Why doesn’t he demand that English students should get the same as Scottish students? It’s disgraceful that English students are leaving university £10,000 more in debt than those in Scotland. When will “English” MPs start standing up for their English constituents? Territorial extent? Is that “UK” or England? Yawn, your back grinding that axe again. How about reforming the Barnett formula to equalise the money per person but England pays back all the oil wealth the Scots have given them, fair? Chris. You’re not concerned that English students, pensioners and everyone else in England gets a worse deal than folks in Scotland then? Seriously you think it’s A-OK do you? Does equality not mean anything to you? I want equal funding, equal services and equal democracy for the people of England. Labour talk a lot about fairness and equality but actually promoted inequality by completely ignoring English issues.